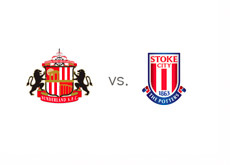 Sunderland welcome Stoke City in the 36th round of the English Premier League on Monday, May 06th, 2013 at the Stadium of Light. Sunderland are in 17th place with three games to go in the season and in dire need of points out of the match with Stoke as they try and avoid relegation. Last season Sunderland beat Stoke at home 4-0 while in the current season the two teams split points (0-0) at the Britannia Stadium. Sunderland got trashed 6-1 in their last match vs. Aston Villa and managed wins vs. Everton 1-0 and Newcastle 0-3 in the two matches before. Stoke City won their last two vs. Norwich 1-0 and QPR 0-2 and lost vs. Manchester United 0-2 in the game before. According to the bookies, Sunderland are the favourites to win at home vs. Stoke. A $100 bet on Sunderland to win earns $115 in profit, while the same bet on Stoke earns $300 in profit. Danny Graham has the highest odds to score for Sunderland at 15/8 (bet $100 to profit $187), while Peter Crouch is the favourite to score for Stoke at 12/5 (bet $100 to profit $240).